The Dream is Dead. Well, maybe not dead, but definitely on life-support. 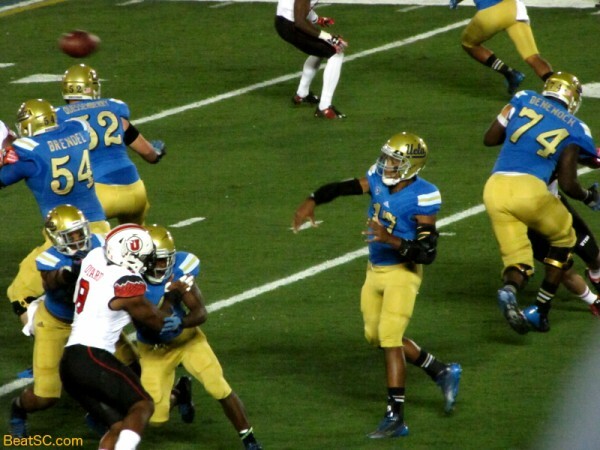 UCLA’s fantasy of an entry into the first-ever College Football Playoff took a nasty, nasty hit on Saturday night, as the Bruins were overrun by 13-point underdog Utah 30-28. In a historical week of upsets which included losses by #2 Oregon, #3 Alabama, #4 Oklahoma, #6 Texas A&M, #16 u$c, and #18 BYU, #8 UCLA joined the (pity) party by falling at home, to an unranked foe. UCLA has a history of failing when they are in a position to climb to (or near) the top of the Rankings. One time when they would have been #1, they inexplicably choked against Washington State. And for the last several years, every time they go on a streak and start to make headway in the polls, they lose to a lesser team and tumble back down. This time, they probably would have been voted #4, if they had handled Utah. Instead, they will drop like a rock, probably out of contention for the Playoffs. Sure, a 1-loss Pac-12 Champ could still eke into the 4-team Playoff, but it seems unlikely. Before the Bruins can think about that, they will need to make some serious adjustments and improvements to their team. Getting Sacked 10 times in one game is a red flag, and points to several facets of the Offense that need to be examined. Was the Offensive Line just too green without two injured starters? 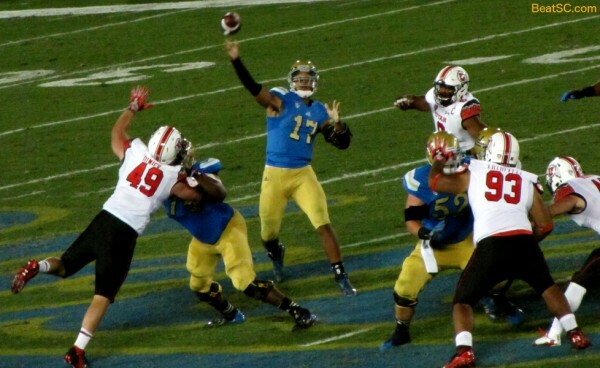 Was Brett Hundley replaced by an impostor? The usually elusive former Heisman candidate seemed lost in the pocket all night, holding the ball too long, and lacking his usually-keen field awareness. Why didn’t he scramble more? Why wasn’t he running the ball at all? OR… should the blame be put on the Offensive Coordinator? Why not call some Draw Plays and Screens? 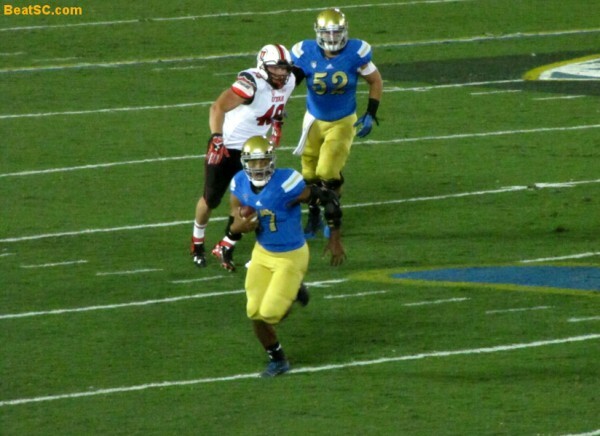 Why not have Hundley roll out more, and move the pocket? Why not call any QB Draws or Read Options to let Hundley freeze the rush by using his legs by design? On the one Screen they did attempt, Hundley threw a Pick 6, but does that mean you shouldn’t try again? O.C. Noel Mazzone is famous for his quick, horizontal passing attack, calling throws behind the line of scrimmage all the way to the sidelines — And then the one game where he really needs that kind of attack to quell the pass rush, he doesn’t dial it up at all. All these questions are legit… and maybe the Utah Defensive Front REALLY IS that good — overwhelming for a decimated OL. Whatever the reason, the Bruins were playing catch-up all night thanks to all the Sacks. But catch up, they did. 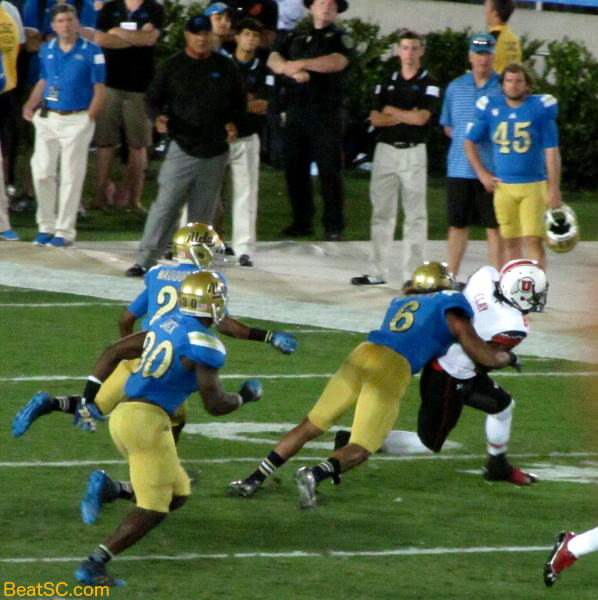 In the 4th Quarter, down by 10, Hundley hit Devin Fuller for a 93-yard TD. The Bruins got the ball back still down only 3, but Hundley got Sacked THREE PLAYS IN A ROW, forcing a punt from the Bruin end zone. Utah took that good field position and capitalized with a Field Goal to go up 6 with 6:21 left. But Hundley didn’t panic. 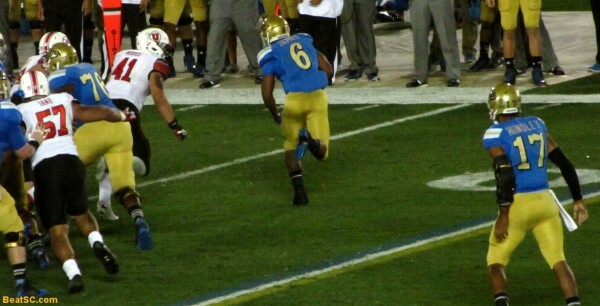 Moments later, he hit Eldridge Massington for a 40-yard TD to give the Bruins their first lead of the game. All they needed was one Defensive stop, and the #4 ranking was theirs. Unfortunately, the Bruin Defense was not up to the task. Utah’s Running Back Devontae Booker got a big chunk of his 162 Rushing yards on this drive, and back-up Quarterback Kendal Thompson added a bunch of his 83 yards Rushing as well, as the Utes drove right into Field Goal range, while bleeding almost all the time off the clock. It was pathetic, because everyone in the stadium knew that those two guys were gonna run the ball, but UCLA still couldn’t come close to stopping them. The Bruins got the ball back with 34 seconds left, and Hundley was able to deftly guide them down to the Utah 37 yard line with time for one more play. Apparently Coach Mora has more faith in Ka’imi Fairbairn than I do, and instead of a Hail Mary, Mora called on Fairbairn to try a 55-yard Field Goal, which would be his longest ever by far. This decision, despite u$c losing on a Hail Mary three hours earlier, and despite u$c scoring on a Hail Mary of their own last week, and despite Arizona winning on a Hail Mary last week. The decision did not work, as Fairbairn missed by 30 yards…but… Utah ran into the kicker, giving Fairbairn one more try, this time from 50 yards out. Fairbairn nailed the ball, and it seemed to have the distance, but did not go through the uprights, so the Bruins lose, and the magical season is a dream no more. Bruin fans can still dream, but it’s more of a pipe dream now. 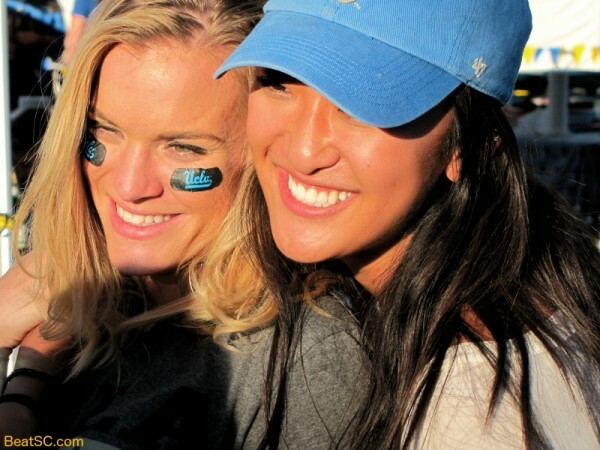 The pain Bruin fans felt this weekend was brutal, but somewhat lessened by what happened to rival u$c. The trojans blew a 9-point lead in the last 5 minutes against Arizona State, allowing 21 points in the final 4 minutes, including a STUNNING 46-yard, game-winning Touchdown pass as time expired. 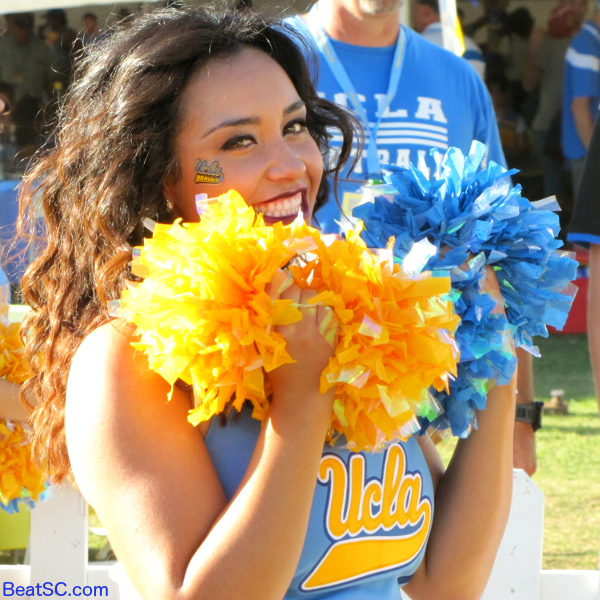 Speaking of STUNNING, the 2014-15 UCLA Spirit Squad made their second Rose Bowl appearance on Saturday (along with some Cheer Squad alumni), and unlike the UCLA and u$c Football teams, THEY took care of business, securing their hold on their National #1 Ranking (in my personal private poll, of course… but I’m not the only one who knows that they are the best of the best. 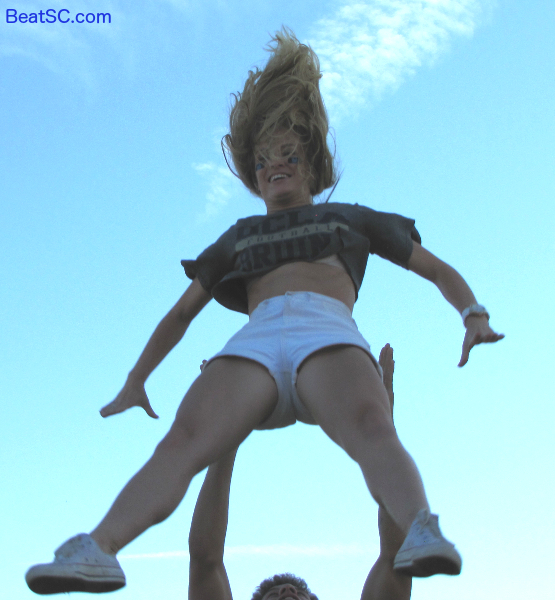 Below are 58 GAME and CHEER photos, where you can see that I am correct). 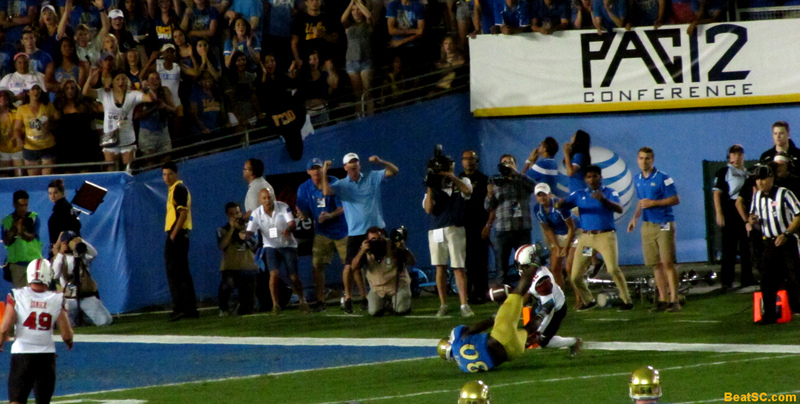 Myles Jack almost makes a remarkable catch of his own, after falling to the turf, but the ball bounces up and is Intercepted. 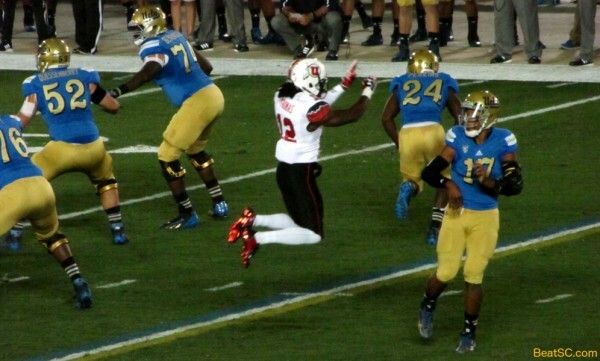 Luckily for UCLA, the play was nullified by a Roughing the Passer Penalty on Utah. Devin Lucien catches a ball over the middle and jukes a defender to gain extra yards. Jordon James turns the corner. 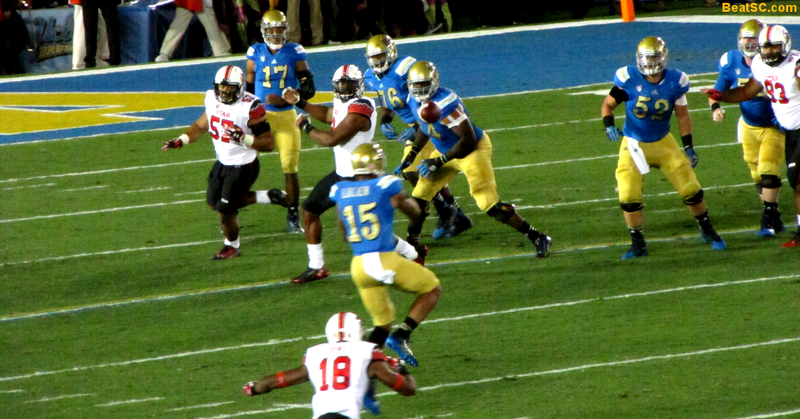 James and Paul Perkins both had some good runs, but none over 22 yards. Nate Starks got a few touches too. 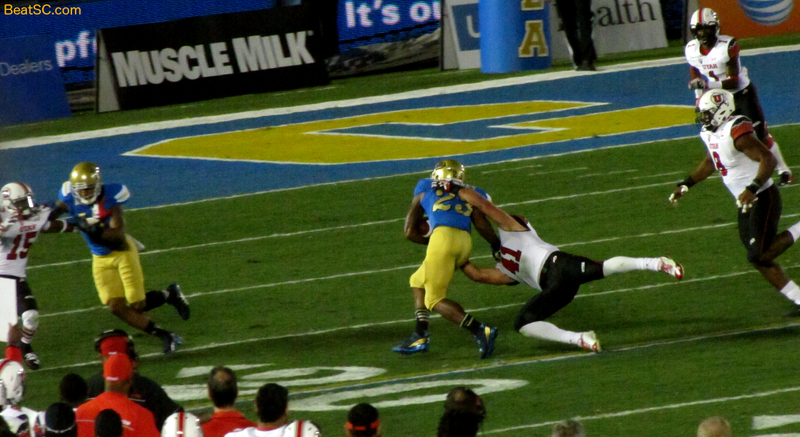 Hundley scrambled a little, but not as much as he needed to. …because there was a lot of open real estate for him to exploit. Even faking to Perkins wasn’t enough to slow down the Utah pass rush. Hundley completed only 16 passes all night. But he did complete the two big ones when he needed to, giving the Bruins a great chance to win. Marcus Rios had his best game as a Bruin, collecting 6 Tackles. The Bruins put more effort (and blitzing) into pressuring the QB this week, but Thompson was too slippery. As usual, Eric Kendricks led the Bruins (with 7 Tackles), but on the final Utah drive, he and his teammates were powerless to stop them. 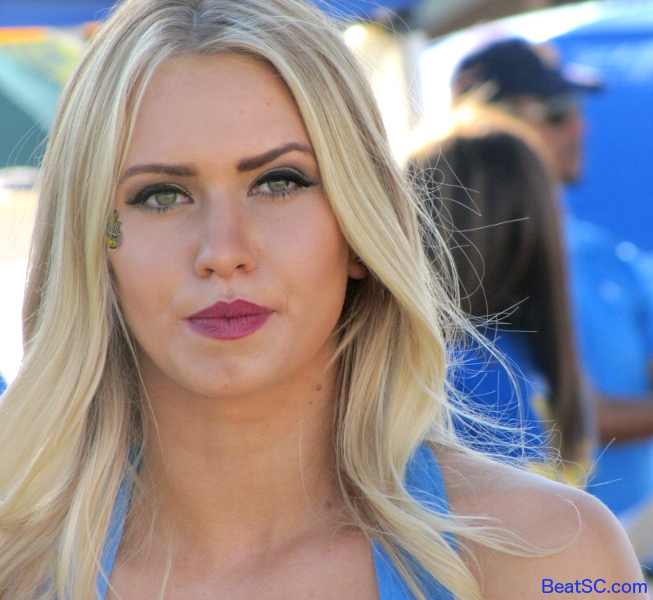 "MASTERS OF SACKS" was published on October 5th, 2014 and is listed in Blue & Gold News, News from the Dark Side, UCLA/usc/Cheerleader Photos, UCLA/usc/Sports Photos. Thanks for the pics and the writeup T-H. Tough day at the office. Giving up 10 sacks will not get it done yet, we had a chance to win it at the end. We’ll have our work cut out for us against Oregon next Saturday. Bring on the Ducks! GO BRUINS! When your offense doesn’t block well, and your defense doesn’t tackle well, and your staff doesn’t adjust well, you’re supposed to lose. Your comments about the offense were spot on. Hundley played as if he were slowed by painkillers–his usual instinctive quickness was not there, nor was the aggressiveness that makes him that much better. So Mazzone’s playcalling under the circumstances was baffling: if it’s the O-line, roll him out! Where was the read-option KEEPER to keep the D off balance? The draw? And the defense played as if it spent the entire week preparing only to play against their first-string QB only, despite that their coach said he planned to use both. When you play against a running QB, you’ve got to CONTAIN. Yet we continued to run stunts that left the outside wide open! And, right again, everyone seemed to know what was coming except Albrecht. One of the five top ten teams that lost this week will go on to run the table and have their one loss forgiven by the committee. But you can’t run the table if you get outblocked, outtackled, or outcoached.